Sunburn — red, painful skin that feels hot to the touch — usually appears within a few hours after too much exposure to ultraviolet (UV) light from sunshine or artificial sources, such as sunlamps. Intense, repeated sun exposure that results in sunburn increases your risk of other skin damage and certain diseases. These include dry or wrinkled skin, dark spots, rough spots, and skin cancers, such as melanoma. You can usually find sunburn relief with simply home remedies. Sunburn may take several days or longer to fade. You can prevent sunburn and related conditions by protecting your skin. This is especially important when you're outdoors, even on cool or cloudy days. Any exposed part of your body — including your earlobes, scalp and lips — can burn. Even covered areas can burn if, for example, your clothing has a loose weave that allows ultraviolet (UV) light through. Your eyes, which are extremely sensitive to the sun's UV light, also can burn. Sunburned eyes may feel painful or gritty. Signs and symptoms of sunburn usually appear within a few hours after sun exposure. But it may take a day or longer to know the full extent of your sunburn. Within a few days, your body may start to heal itself by "peeling" the top layer of damaged skin. After peeling, your skin may temporarily have an irregular color and pattern. A bad sunburn may take several days or longer to heal. Melanin is a natural pigment that gives your skin its color. It's produced in cells called melanocytes. Sunburns are caused by exposure to too much ultraviolet (UV) light. UV radiation is a wavelength of sunlight in a range too short for the human eye to see. Ultraviolet A (UVA) is the type of solar radiation most associated with skin aging (photoaging). Ultraviolet B (UVB) is associated with sunburn. Exposure to both types of radiation is associated with developing skin cancer. Sunlamps and tanning beds also produce UV light and can cause sunburn. 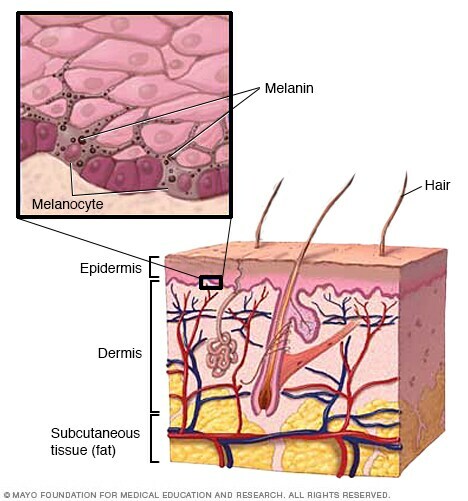 Melanin is the dark pigment in the outer layer of skin (epidermis) that gives your skin its normal color. When you're exposed to UV light, your body protects itself by accelerating the production of melanin. The extra melanin creates the darker color of a tan. A suntan is your body's way of blocking the UV rays to prevent sunburn and other skin damage. But the protection only goes so far. The amount of melanin you produce is determined genetically. Many people simply don't produce enough melanin to protect the skin well. Eventually, UV light causes the skin to burn, bringing pain, redness and swelling. You can get sunburn on cool, hazy or cloudy days. As much as 80 percent of UV rays pass through clouds. Snow, sand, water and other surfaces can reflect UV rays, burning your skin as severely as direct sunlight. Intense, repeated sun exposure that results in sunburn increases your risk of other skin damage and certain diseases. These include premature aging of your skin (photoaging) and skin cancer. Precancerous skin lesions appear as rough, scaly patches in areas that have been damaged by the sun. They may be whitish, pink, tan or brown. They're usually found on the sun-exposed areas of the head, face, neck and hands of light-skinned people. These patches can evolve into skin cancer. They're also called actinic keratoses (ak-TIN-ik ker-uh-TOE-seez) and solar keratoses. Excessive sun exposure, even without sunburn, increases your risk of skin cancer, such as melanoma. It can damage the DNA of skin cells. Sunburns in childhood and adolescence may increase your risk of developing melanoma later in life. Skin cancer develops mainly on areas of the body most exposed to sunlight, including the scalp, face, lips, ears, neck, chest, arms, hands and legs. Skin cancer on the leg is more common in women than in men. Some types of skin cancer appear as a small growth or a sore that bleeds easily, crusts over, heals and then reopens. With melanoma, an existing mole may change or a new, suspicious-looking mole may develop. A type of melanoma called lentigo maligna develops in areas of long-term sun exposure. It starts as a tan flat spot that slowly darkens and enlarges. See your doctor if you notice a new skin growth, a bothersome change in your skin, a change in the appearance or texture of a mole, or a sore that doesn't heal. The sun can also burn your eyes. Too much UV light damages the retina, lens or cornea. Sun damage to the lens can lead to clouding of the lens (cataracts). Sunburned eyes may feel painful or gritty. Sunburn of the cornea is also called snow blindness. Use these methods to prevent sunburn, even on cool, cloudy or hazy days. And be extra careful around water, snow and sand because they reflect the sun's rays. In addition, UV light is more intense at high altitudes. Avoid sun exposure between 10 a.m. and 4 p.m. The sun's rays are strongest during these hours, so try to schedule outdoor activities for other times. If you can't do that, limit the length of time you're in the sun. Seek shade when possible. Avoid sun tanning and tanning beds. Using tanning beds to obtain a base tan doesn't decrease your risk of sunburn. Cover up. When outside, wear a wide-brimmed hat and clothing that covers you, including your arms and legs. Dark colors offer more protection, as do tightly woven fabrics. Consider using outdoor gear specially designed to provide sun protection. Check the label for its ultraviolet protection factor (UPF), which indicates how effectively a fabric blocks damaging sunlight. The higher the number, the better. Use sunscreen frequently and generously. Apply water-resistant sunscreen and lip balm with an SPF of 30 or greater and broad-spectrum protection against UVA and UVB rays. About 15 to 30 minutes before going outdoors, apply sunscreen generously on skin that won't be protected by clothing. Put on more sunscreen every 40 to 80 minutes, or sooner if it has washed off from swimming or sweating. If you're also using insect repellent, apply the sunscreen first. The Centers for Disease Control and Prevention does not recommend products that combine an insect repellent with a sunscreen. The Food and Drug Administration requires all sunscreen to retain its original strength for at least three years. Check the sunscreen labels for directions on storing and expiration dates. Throw sunscreen away if it's expired or more than three years old. The American Academy of Pediatrics recommends using other forms of sun protection, such as shade or clothing, for babies and toddlers. Keep them cool and hydrated. You may use sunscreen on babies and toddlers when sun protective clothing and shade aren't available. The best products for them are those that contain physical blockers (titanium oxide, zinc oxide), as they may cause less skin irritation. Wear sunglasses when outdoors. Choose sunglasses with UVA and UVB protection. Check the UV rating on the label when buying new glasses. Darker lenses are not necessarily better at blocking UV rays. It also helps to wear sunglasses that fit close to your face and have wraparound frames that block sunlight from all angles. Be aware of medications that increase your sensitivity to the sun. Common drugs that make you more sensitive to sunlight include antihistamines, ibuprofen, certain antibiotics, antidepressants, antipsychotics and some cholesterol-lowering drugs. Talk with your pharmacist about your medication side effects. You're heading to the pool or beach, and you stop to pick up some sunscreen. But knowing what is the best SPF is tough when you have no idea what SPF actually means. "It stands for sun protection factor. Is simply a ratio of the number of minutes that you can stay outside with the product on before getting minimal redness to the skin." And Dr. Dawn Davis, a Mayo Clinic dermatologist, says preventing that painful redness is one of the biggest factors in preventing skin cancer. So how do sunscreen brands calculate an SPF? "So if you stand outside in a particular location and you're testing the sunscreen and it takes you 10 minutes to develop redness to the skin without the product on, but then you apply the product on a different area of skin and it takes 50 minutes for the skin to show redness, then that is an SPF factor of 50 over 10, which equals 5." Dr. Davis recommends a minimum of SPF 30, which theoretically means you could stay protected from UV rays 30 times longer than without sunscreen. For the Mayo Clinic News Network, I'm Ian Roth. Young AR, et al. Sunburn. http://www.uptodate.com/home. Accessed Jan. 20, 2017. Baron ED. Selection of sunscreen and sun-protective measures. http://www.uptodate.com/home. Accessed Jan. 20, 2017. Chien AL, et al. Photoaging. http://www.uptodate.com/home. Accessed Jan. 20, 2017. Geller AC, et al. Primary prevention of melanoma. http://www.uptodate.com/home. Accessed Jan. 20, 2017. Murphy F, et al. Treatment for burn blisters: Debride or leave intact. Emergency Nurse. 2014;22:24. The sun and your medicine. U.S. Food & Drug Administration. http://www.fda.gov/drugs/resourcesforyou/specialfeatures/ucm464195.htm. Accessed Jan. 24, 2017. The risks of tanning. U.S. Food and Drug Administration. http://www.fda.gov/radiation-emittingproducts/radiationemittingproductsandprocedures/tanning/ucm116432.htm. Accessed Jan. 20, 2017. Benzocaine topical products: Sprays, gels and liquids: Risk of methemoglobinemia. U.S. Food and Drug Administration. http://www.fda.gov/Safety/MedWatch/SafetyInformation/SafetyAlertsforHumanMedicalProducts/ucm250264.htm. Accessed Jan. 20, 2017. AskMayoExpert. Sunburn. Rochester, Minn.: Mayo Foundation for Medical Education and Research; 2018. Kong BY, et al. Assessment of consumer knowledge of new sunscreen labels. JAMA Dermatology. 2015;151:1028. Bope ET, et al. Sunburn. In: Conn's Current Therapy 2017. Philadelphia, Pa.: Elsevier; 2017. https://www.clinicalkey.com. Accessed Jan. 20, 2017. Reed KB, et al. The cutaneous manifestations of metastatic malignant melanoma. International Journal of Dermatology. 2012;51:243. Sunscreen FAQs. American Academy of Dermatology. https://www.aad.org/media/stats/prevention-and-care/sunscreen-faqs. Accessed May 18, 2018. Diaz JH, et al. Sun exposure behavior and protection: Recommendations for travelers. Journal of Travel Medicine. 2013;20:108. Reinau D, et al. Outdoor workers' sun-related knowledge, attitudes and protective behaviours: A systematic review of cross-sectional and interventional studies. British Journal of Dermatology. 2013;168:928. Sun safety and protection tips. American Academy of Pediatrics. https://www.aap.org/en-us/about-the-aap/aap-press-room/news-features-and-safety-tips/Pages/Sun-Safety-and-Protection.aspx. Accessed May 23, 2018. Protecting yourself. Protecting the reef. National Park Service. https://www.nps.gov/hale/planyourvisit/sunscreen.htm. Accessed May 23, 2018. Sunscreen: How to help protect your skin from the sun. U.S. Food & Drug Administration. https://www.fda.gov/Drugs/ResourcesForYou/Consumers/BuyingUsingMedicineSafely/UnderstandingOver-the-CounterMedicines/ucm239463.htm. Accessed May 23, 2018. Tanning: Does a base tan prevent sunburn? Sunburn treatment: Do I need medical attention?